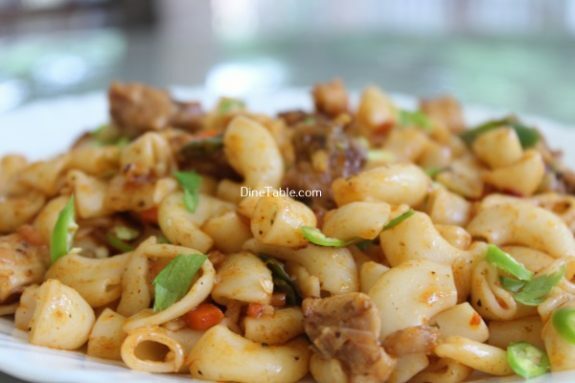 Chicken macaroni is very easy to make and can be made for a quick breakfast or lunch. Pasta is a traditional Italian food, nowadays found all over the world. They are made with durum wheat flour. Just like noodles, pasta can be made fresh at home or can be store bought. They are also available in various shapes and sizes. 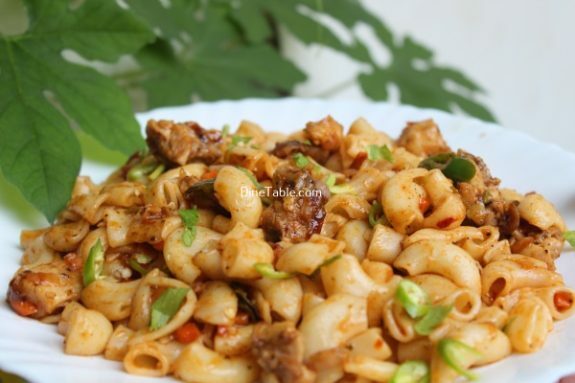 This chicken Macaroni is perfect for your kids lunch box. With regards to Nutrition facts, this is high in complex carbohydrates, which helps to give you energy. Instead of a quick burst of energy, complex carbohydrates provide a “time release” of energy. 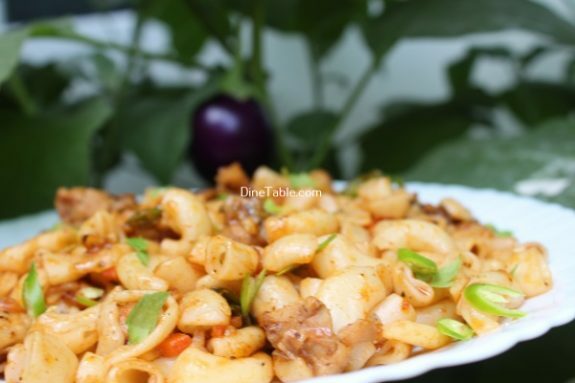 Whole wheat macaroni is a good source of certain vitamins and minerals that support good health. 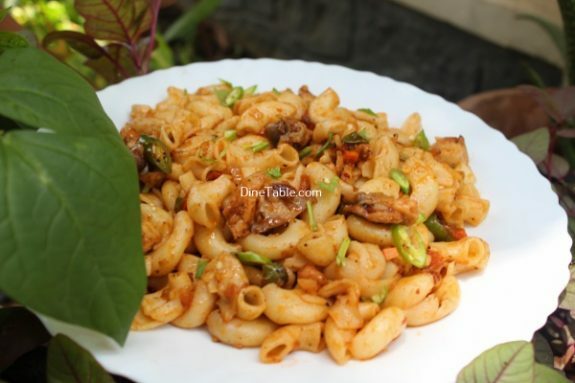 macaroni also offer good levels of B vitamins and iron, and has a fair amount of dietary fiber. 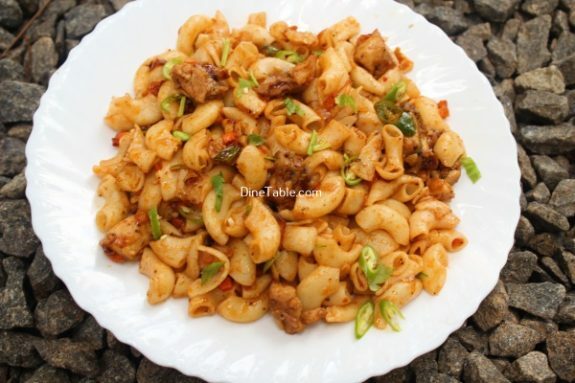 Try this yummy dish and enjoy! Boil 400 ml of water in a large pan and add little salt into it. 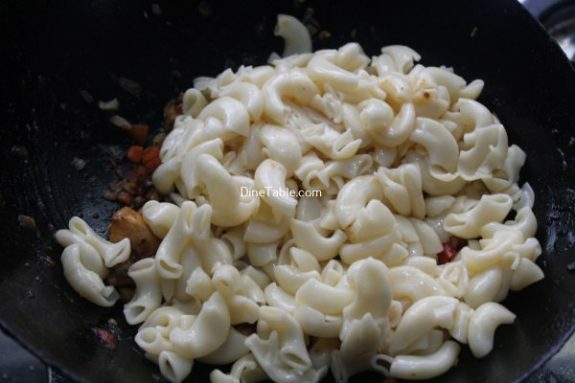 Once the water starts boiling, add macaroni and cook for 10 minutes. 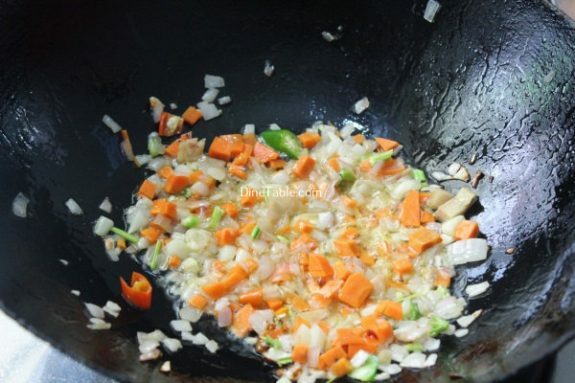 After the macaroni are cooked, strain water and toss the macaroni with 1 tbsp of vegetable oil so that they do not stick. Keep it aside. Wash and clean the chicken. Cut it into small pieces. 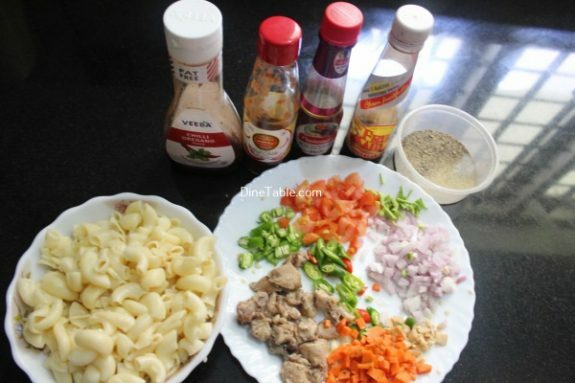 Heat a pressure cooker and add chicken with salt, 50 ml of water and 1/2 tsp pepper powder. 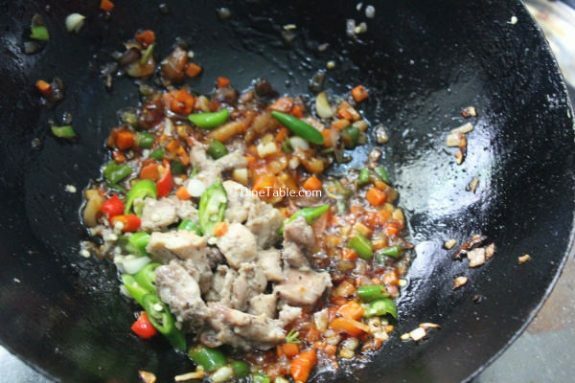 Cook this for 3 whistle. Keep it aside. 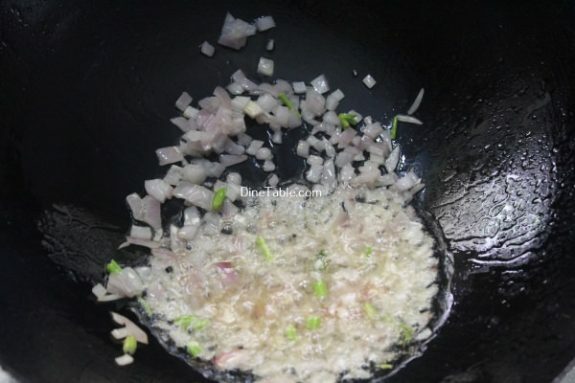 Heat 4 tsp of oil in a pan and saute onions, ginger, garlic for 3 minutes. 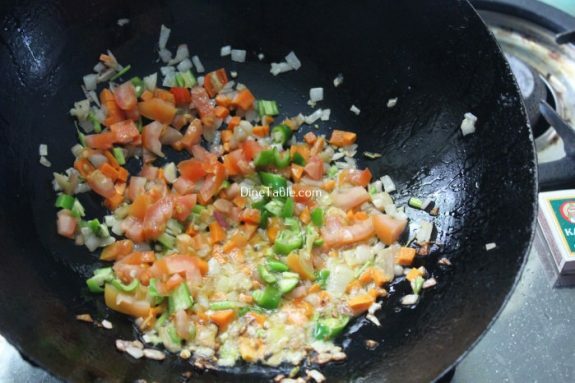 When onion becomes cooked add chopped carrots, green chilly, and salt. Cover and cook for 5 minutes in a low flame. 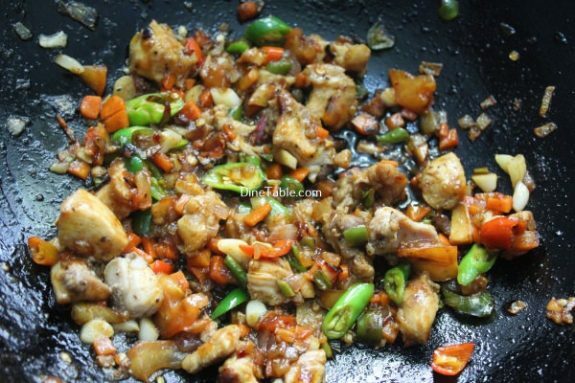 Once the vegetables are cooked add soya sauce, chilly oregano sauce, tomato sauce , red chilly sauce, pepper powder, cooked chicken and mix well. 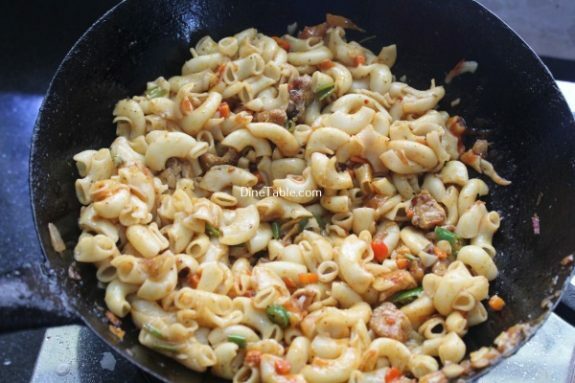 Add cooked macaroni, celery and mix well. Cook this for 3 minutes in a low flame. Switch off the flame. 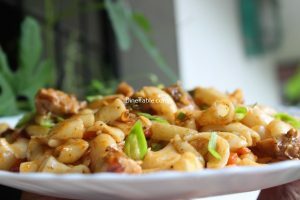 Yummy Chicken Macaroni is ready.